Presented by Atomique Productions & Degree One..
BOXING DAY THE STIR FRY WAY!! 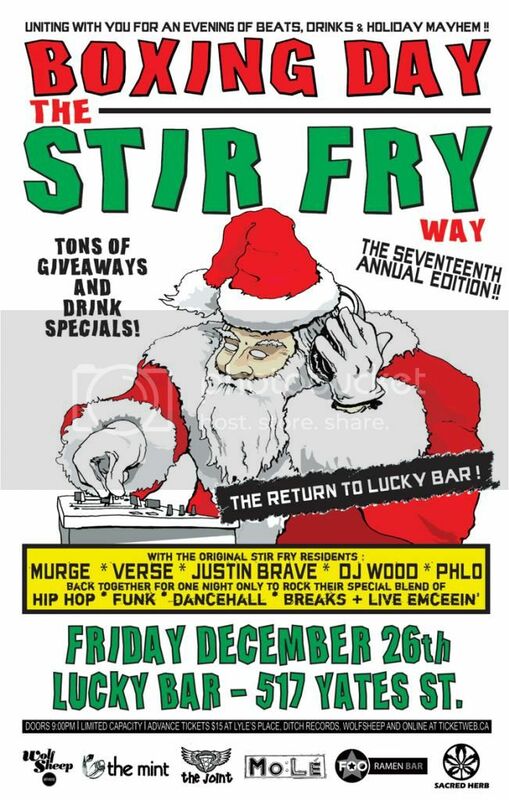 The Original Stir Fry residents are back once again with their unique blend of club bangin' Hip Hop, Dancehall, Electro, Mash-Ups, Breaks, & live emceeing' and this time they will be returning to their old home of LUCKY BAR! Make sure to support our rad sponsors.. Foo Ramen Bar, Sacred Herb,Wolf/Sheep Arthouse, The Mint/ Mint for Lunch, The Joint Pizzeria and MoLe Restaurant.